Bumbles of Rice turned two on Monday. I’d planned to write a lovely blogpost (lies, I realised at lunchtime on the day) but I’d a deadline to reach to get my post finished before The Busy Mama’s linky closed, so this had to wait til now. Two whole years. We’ve come a long way from the first blogpost. I’ve written 150 posts, this is my 151st. It’s been great fun. This time last year I gave a little rundown of the year that had past, so here’s a brief attempt this year. 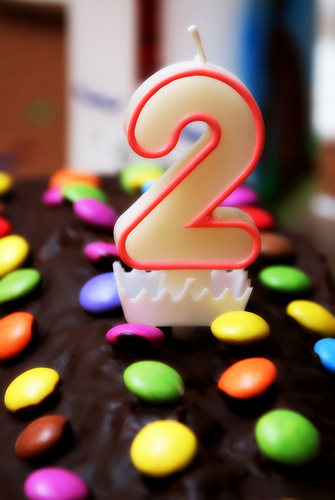 It’s been an exciting year for the blog. I really only started blogging about parenting just over a year ago, and I am enjoying it, I feel like I’ve discovered a new voice. I don’t pretend that I’m an authority on any of these parenting topics, I’m not, I’m just trying to share lessons I’ve learned and experiences I’ve had, in the hope that others will feel better about themselves, or at least one of us will feel more normal. One of the really fun things about blogging has been our 15 minutes of “fame”. 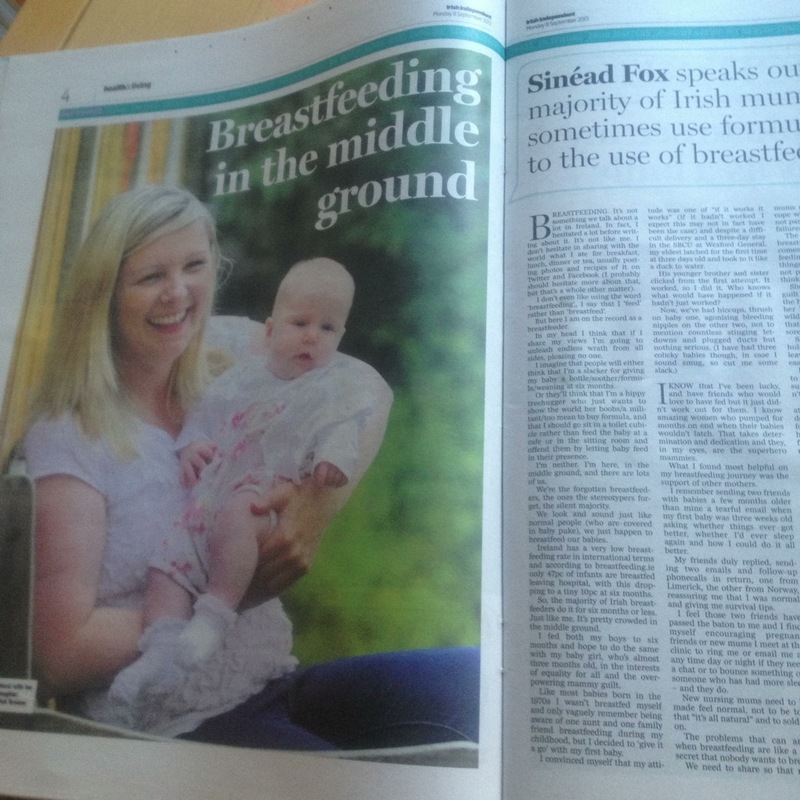 In August we appeared in the Irish Times in an article about cooking, then in September an article that I wrote about breastfeeding was published in the Irish Independent (see photo above). I couldn’t believe it, something I wrote was in a publication that people paid for. I was on cloud nine. Since then, my writing has been published in The Journal.ie (three whole articles) and in the Irish Independent again, as well as on eumom.ie and parent.ie. My blog has been recommended on national TV and in the Irish Independent “Diary of a Working Mum“. I’ve even been interviewed on the radio twice! It’s a whirlwind, and I’ve just loved the new experiences that the blog has given me. The kids and I have been to a the launch of a cartoon series as part of the Netflix Stream Team and to a special viewing of a Disney movie. We’re all getting something back from the time I spend stuck to the laptop when they are all asleep. Blogging has ignited a part of my brain that I hadn’t used for years, it has opened doors that I wouldn’t have even known existed and it has helped me expand my support networks, and made me some great new friends. What was popular on the blog in the last year? Recipe wise you all still love the Chicken and Broccoli bake and Malteser Traybake and Ciaran’s pirate ship birthday cake was very popular too. My most popular parenting posts were my tribute to maternity leave and my “tantrum series”. I started a couple of series – Cookbook of the Week, which I only managed to maintain for a short amount of time and the popular “Week in Dinners” series. I hosted a “linky” for Week in Dinners which was really popular, we are a nosey bunch it seems, and we all loved reading about what everyone else eats for dinner. (Which reminds me- I have yet to write and publish the promised summary post) . While I love to write, what I love even more is to know that someone is reading. I love the little light that shows me that someone has left a comment and I always try to reply. So, thanks so much for reading my ramblings, and for making blogging so interactive for me. I’m delighted that June 2014 was the busiest month yet on the blog, with the most pageviews in a month so far. Onward and upward! Remember you can also follow me on twitter, Facebook, Instagram- I’m bumblesofrice. I also occasionally do the pinterest thing and google+ too. Congrats, may the next year be just as successful! Well done Sinead I so enjoy reading your blogs – keep up the good work – imagine it will be soon 12 years since we last saw each other -Rachel is getting married this August and James & me are off to Cardiff for the weekend on our own !